Of all the amazingly wonderful things that happened over the last few days as I celebrated my birthday, one part that keeps coming back to me in vivid, exciting detail has to do with olives. Yes, olives. And believe it or not, my path to olive love hasn't been an easy one. For starters, I've never been a fan of the black olives you see on pizzas here in the States, and I really don't understand why people eat them whole, out of a jar. Ew! But a few years ago, somehow, on a whim I tried some Kalamata olives, and hark! all was not lost, after all. I've spent the last few years studying the health benefits of olives and olive oil, and I've known that eating more olives = health (well, as long as I know where they've come from, and how they were cultivated, cured, etc). Scott brings home olives that are stuffed with garlic and jalapenos, and those are good, but so very cured. You know what I mean? YUM! Don't you just want to eat them all?! Oh MY, you guys. You have no idea. "Party in your mouth" is too crass a statement for these gentle, lovely things. 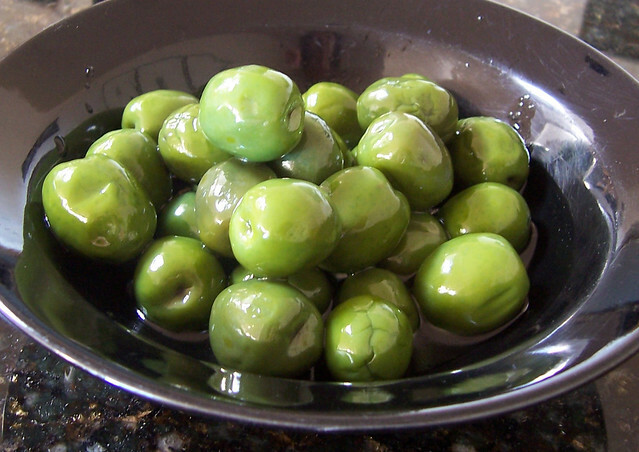 The internet told me that these beauties are Castelvetrano Olives, and they hail from a region of Sicily. Let me just interrupt myself for a moment and say: doesn't "Castelvetrano" sound like a spell in Harry Potter? Anyway.Cough. These olives, as you may have already guessed, tasted incredible. Since they are lightly brined, I felt like I was actually eating olives, like fresh olives, except that they weren't bitter like the reality of truly fresh olives. They were incredibly tasty. I want to write songs about them, take them on vacation, invite them to live with me forever. They were that good. In conclusion / the moral of the story: do you like Castelvetrano olives? Have you ever tried them? I hear they're available at the Whole Foods olive bar, and you can bet I will be heading over there as soon as I have time to grab a tub for myself. If you don't like these olives, or have never had them, what olives do you like? Olive them? Har. Har. See what I did there? I don't know that I've tried Castelvetrano Olives, but I sure do love regular ole green olives. I love salt, I LOVE pickles, I love capers, I love briny but I do not like olives. I was assured by one of my chefs in culinary school that one day I will find the olive that will make me love olives. Could Castelvetrano olives be the ONE? I sure hope so. They look delicious. I truly hope you love them! My mom hunted them down at her local New Seasons (like Whole Foods, except its a local chain in Oregon) and she loved them! I have been skeptical of olives my entire life, so this is a recent thing.